I'm taking a break from fandom. Admittedly, I've not been very engaged in these last years mostly due to RL commitments, but it feels like the right time to step back, or at least tell myself that I'm taking a break officially so I'm not feeling a weird sense of obligation to stay half-tuned into what's going on, which I've tried to do even though I've not been posting. It saddens me a little that I'm not feeling up to keeping up with debates/discussion/meta, something I've so enjoyed in the past. But I feel a sense of futility when I read wanky, cranky, ranty, accusatory meta and wonder how that's at all productive and enjoyable for me (however, it may be engaging and interesting for everyone else and that's awesome). I'll still be watching SPN and posting at spnematography, but beyond that I'll be hibernating. So this is me giving myself permission to sign off from the larger beast that is the SPN fandom for a while. Maybe I'll catch some of you on the flip side if you're still around, too. Take care of yourselves, flisties. I'm hoping I'll eventually wander back, invigorated and bursting with stuff to say, but most of all loving SPN and fandom again. Surprise! I'm still here (barely)! Argh, you guys, so many Show thoughts, so little time!!!!!! So I’m suppose to be working on grant applications for Important Things for one of my kids, but instead my brain wants to think about SPN. This is so typical that I’m thinking I should try to trick myself into thinking I have Important Time-Sensitive Things to do in order to puke out things like this that I normally wouldn’t bother to find the time to do (because, you know, making dinner and washing laundry and driving kids all over the world is all time consuming (and sometimes coma inducing)). Part of me just wants to write on these applications: “Just give me the money, OKAY!? !” but I don’t think that would be very convincing even with a smiley face and a promise not to spend it self-medicating on chocolate. After watching this I'm now convinced that this song must be playing (instead of Skynyrd's "Free Bird") in the final moments when SPN fades to black forever (barring the motion picture release a couple years down the road *wink*). I dare you to watch this and not cry. Robert Plant cried it was so freaking amazing. 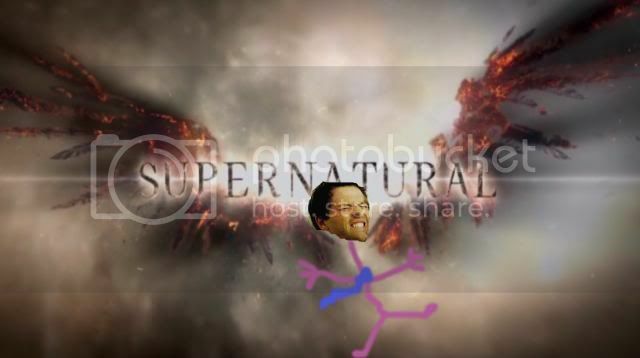 And poor Cas. No hard feelings, okay? Yay, I LOVE SPN Parties! Just a quick post to say, "YAY! SPN FANDOM!!!!" I love that Show love is circulating like a rampant cases of head lice (OK, that simile is sort of gross). Thanks so much to everyone on my flist who is posting such awesome and interesting tidbits about their insights and personal connections to SPN and its characters and how that's evolved over the last 8 seasons. It's so interesting to learn more about each of you and what brings you here. In a way, I feel like this collected squee-ish vibe is reminiscent of S2/S3 when it seemed that LJ was a hotbed for all things SPN, and it's nice to see that even though social media and other fannish platforms have changed the fannish population on LJ, there is still a definite community here--one that's interested in connection, sharing, celebration, and positivity. :) So thanks everyone for being here and spending the time to contribute to the SPN Love Party! And on a totally hypocritical note, I'm swamped in RL so I have very little to contribute to the party except for this post *uber sadface x a millionthousandbagillion* and my virtual cheerleading pompoms, obnoxious herkie jumps, and these celebratory gifs. You guys rock! i got my spn party socks on! And now I'm going to have to find an awesome cup with a ceramic duck stuck to the bottom of it for ME my kiddos because if that doesn't get them to finish their milk then nothing will. I’m not sure how many of you follow national or US politics, but good f***, the state I live in is going down the crapper. Literally. I’ve usually refrained from using LJ for RL life rants, but grumbling about this with A and select friends and getting disbelieving and sympathetic comments from my parents only goes so far. I’m so angry I can’t see straight, thus the political post to vent ALL THE FRUSTRATION in a safe, harmless way. If this isn’t your thing or if you’re a staunch tea party member stop reading now. This is probably the rantiest post I’ve ever written. Ever. Do not read if you don’t want your Show squee to be harshed. Why does my mood theme not have an option for "insane"?! Is that not a relevant state of mind? 2. Who else is watching Kripke's "Revolution" on NBC? Anyone? Bueller? Is it bad that I keep inserting Sam and Dean and thinking, "This would be so much better if there were Winchesters," or imagining that it's really SPN's 2014 post-apocalypse universe and expecting Dean and his thigh holster and stoner!Cas and his sandals to pop up from behind a bush, or saying out loud that "Revolution" needs a toilet-paper hoarding character like Chuck. Bargh. Apparently Show has ruined me for all other shows. 3. I finally watched "The Hunger Games". I know, I'm totally behind in pretty much everything (Don't even ask about my clothes. I now understand those mom makeovers whereas before I always wondered how the heck someone could let themselves wear such clothes and look so ... mom-ish. If I ever want to be stylish again, I'm going to have to go back to working outside the home so I have an excuse to literally buy an entire new wardrobe. Yes, it's that bad.). Now I'm going to have to actually read the books. Wish me luck. I haven't had the attention and time to read a published book since T was born. Does anyone know anything about the "Hunger Games" fandom? Active? General demographic? Super wanky and/or irrationally shippy? LJ communities, yay or nay? 4. How scary is "The Walking Dead"? Like nightmare worthy or just-jump-around-in-your-seat-then-laugh-at-yourself scary or I'm-never-going-into-my-garage-at-night-EVER-AGAIN-EVER scary? I watched a webisode series quite a while ago and cried the whole time because I was freaked out (OK, not cry cried, but apparently the flight and fright part of my lizard brain is hot wired to my tear ducts, I know, WEIRD). Now I want to watch it because ZOMBIES *makes a zombie face*, but I'm afraid I'm just going to be a freaked-out teary mess who goes through a box of Kleenex every episode and then never goes into the garage at night EVER AGAIN EVER. 5. Boston, you're in my thoughts tonight. “As Time Goes By” (8x12) was Serge Ladouceur’s, SPN’s Director of Photography, first solo directing gig. I thought it was well done. Not only was it filled with pleasantly surprising choices but also showed an understanding of how to exploit the camera to tell a complimentary visual story to the scripted story, making it feel like he really understood the dramatic purpose behind the scenes and manipulated the visual elements effectively and accordingly. There are four notable examples that stood out to me that I’m going to geek out talk about below. Apparently this is what happens when an episode (8x10) leaves me making my bhuz face and saying, “Really?” at the TV. "May I have my profilac ... tic?" "Did Steve tell you that?"